Paul A. Karas, New York State Department of Transportation acting commissioner, announced a major milestone in the effort to construct a new intermodal transportation hub for downtown Buffalo. A contract has been awarded to design and build the new Exchange Street Station, a state-of-the-art transportation center that will bring travelers directly into the heart of the city and offer easy connections to bus and light rail service. The new station will promote economic activity and tourism for the area's many attractions. "Buffalo has experienced an unprecedented economic resurgence in recent years and the new Exchange Street Station will help continue that trend toward a more vibrant, prosperous downtown," Karas said. "The new train station for downtown Buffalo will make travel easier for residents and visitors alike, while also spurring economic activity and tourism." Located near such popular destinations as Canalside and the Key Bank Arena, the new station will be constructed on the same grounds as the existing 66-year-old Amtrak Station, but will be elevated and moved closer to the street to improve access and visibility. A planned second phase of the project will expand the station further to accommodate intercity bus service and additional train routes, creating a truly intermodal transit center for downtown Buffalo. The project is expected to be completed in the fall of 2020. The new station will be woven into Buffalo's urban fabric, with improved connectivity to the city's light rail system — via a new covered pedestrian plaza — and increased accommodation for vehicles, pedestrians and bicyclists. It will be more than double the size of the existing building and will also have additional seating, more parking and redesigned platforms to make it easier and safer for passengers to board and depart trains. Seating capacity at the facility will increase from 20 to 40 persons, while the image of a Buffalo also will be featured at the center of the station's Terrazzo floor. The existing station's low-level platform will be replaced by a new train-level platform for easier boarding. It also will be longer and have new lighting and a canopy. The new station also will include a Taste NY kiosk that will provide food and beverage choices for passengers. Energy efficient and environmentally friendly materials will be used in the new station's construction and the facility will be compliant with the Americans with Disabilities Act. 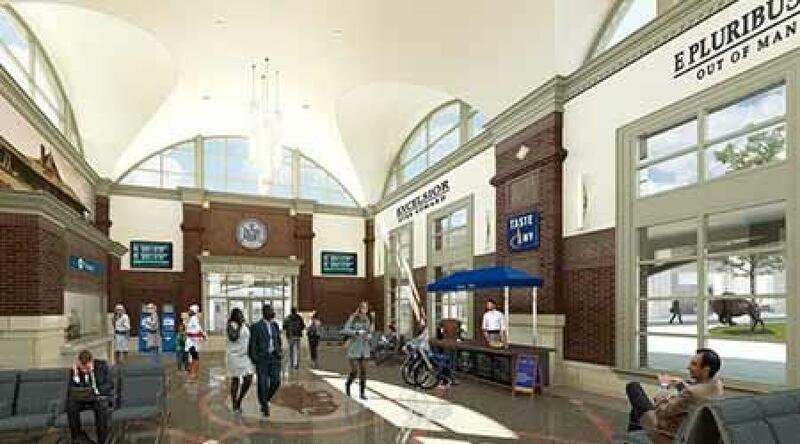 The NYSDOT assumed control of the project to replace the train station after the city of Buffalo conducted a location study that resulted in the decision to use the existing station's footprint for the new and improved facility. The project calls for the old station to be demolished and the new, larger station built at the same location. A temporary station will be erected to service passengers during the construction process. To save time and reduce costs, the $27.7 million contract will employ the design-build project delivery method where both the engineering design and the construction of a project are contracted by a single entity known as the design-builder. By utilizing design-build contracting to advance the project, construction on some aspects of the work can begin before the design of other components is completed. This ultimately results in quicker construction and a shorter overall project duration. Richard A. Ball, New York State Agriculture commissioner said, "Since the Governor launched Taste NY, the program has grown tremendously, helping our local farms and food and beverage producers get their products into the hands of consumers across the state and around the globe. The new station will also include the opportunity for passengers to purchase Taste NY food and beverages." Sen. Tim Kennedy said, "As downtown Buffalo's business and entertainment landscapes continue to see a transformation, so too should its transportation system. With the redevelopment of the Exchange Street Station secured, we're one step closer to increasing accessibility for visitors and accommodating the increased interest in all that our city has to offer." Buffalo Mayor Byron W. Brown said, "This announcement is another step forward to modernize and enhance public accessibility and passenger experience in downtown Buffalo. I thank the Department of Transportation for their continued commitment and investment in Buffalo's future. Construction of this new station represents a collaborative decision-making process, where all of the stakeholders worked together to determine the best location for a new, better connected train station that will more efficiently serve residents of and visitors to the city of Buffalo." Built in 1952, the original Buffalo Station is an important stop along the Niagara Branch of the Empire Corridor, linking Buffalo, Niagara and Toronto. Approximately 38,000 passengers use the station annually.